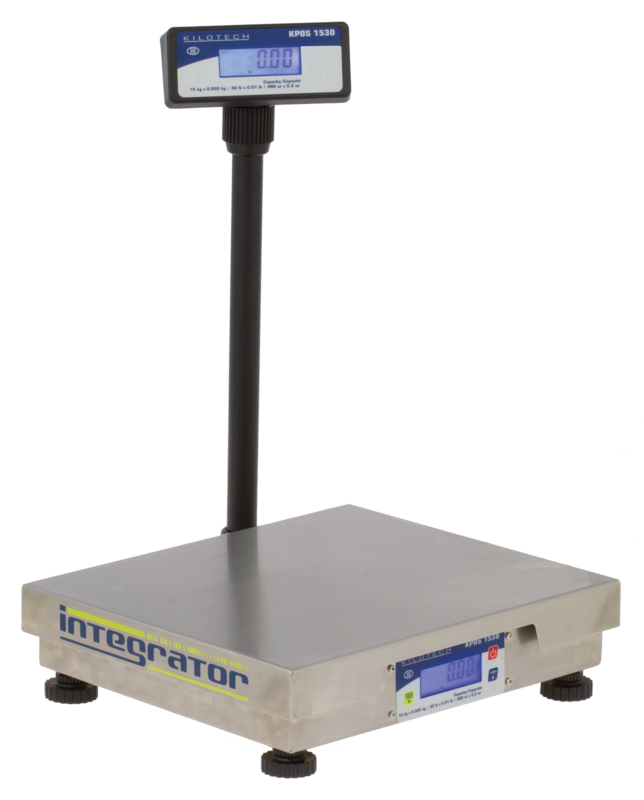 The Kilotech KPOS 1530 Interface Scale is a bench scale designed specifically for use at the checkout and interfaced directly to the POS / Cash Register system. Ideal for a variety of quick service restaurant (QSR) concepts, frozen yogurt, deli, cafeteria, convenience, hardware, bulk food, pet, candy, café or anywhere retail products are sold by weight at a cash register. The Kilotech KPOS 1530 Interface Scale makes integration easy. The KPOS 1530 connects with most major point of sale systems and cash registers via USB or RS232. An OPOS driver is available for quick and simplified set-up. Place it where you need it! The KPOS 1530’s sleek low profile design can be used on a countertop or recessed into the check out lane. The Kilotech KPOS 1530 integration scale comes with either a built-in LCD customer display, or an optional external remote pole display. Both customer displays are bright and easy to read with user friendly status indicators. With only two buttons to use – power and zero – the KPOS 1530 couldn’t be easier to use for cashiers. The KPOS 1530 comes equipped with three weight modes: ounces (oz), pounds (lb), or kilograms (kg) and is Legal for Trade in Canada. The Kilotech KPOS 1530 is constructed strong with heavy duty cast aluminum and the platter is made of stainless steel for quick and easy cleaning. Adjustable filter settings assist in reducing environmental vibrations for a quick and accurate reading every time. The Kilotech KPOS 1530 scale is compatible with Catapult Retail POS Software.